Traditional borscht recipes call for beets and sour cream. This soup recipe from the Ukraine varies depending on the chef. As a result, health benefits can vary. Beets have several health-protective qualities, making for a potential nutritional powerhouse. Apart from the traditional beets and sour cream, borscht ingredients differ by country and cook. Some recipes call for additional vegetables like cabbage, potatoes, carrots, onions, garlic and tomato paste, along with beef stock. 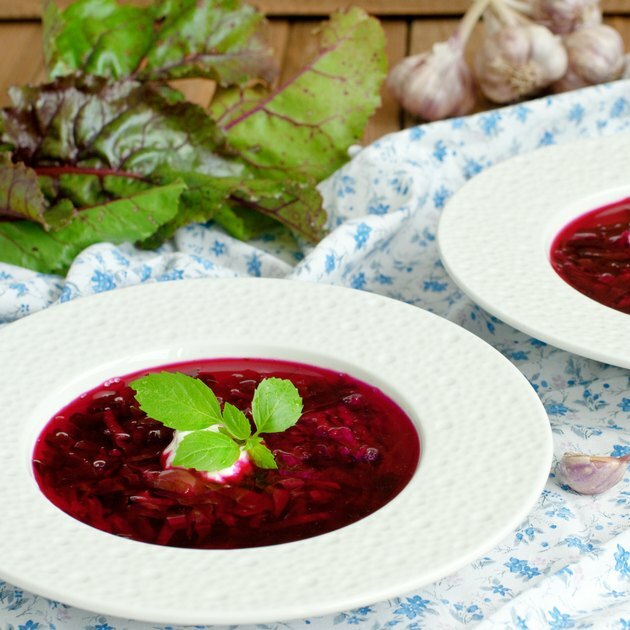 Borscht's vegetables are rich in antioxidants, B vitamins and vitamin C. According to the American Diabetes Association, however, a traditional borscht recipe also contains 1.2 grams of saturated fat and 4 grams of cholesterol per 1/2 cup, with no heart-healthy monounsaturated or polyunsaturated fats. Eating borscht may help people who have high blood pressure. A study published in 2013 in the American Heart Association's journal "Hypertension" found people with high blood pressure experienced a blood pressure drop of 10 mm Hg after drinking 8 ounces of beetroot juice. The benefits began just three hours after drinking beetroot juice and were still present 24 hours later. Beetroot juice also contains dietary nitrate, a compound that can help improve blood flow and relax blood vessels. A 2007 study on rats from the Semmelweis University's Department of Medicine in Budapest, Hungary, found eating beets might protect the liver. This is due to beets' high content of specific protective compounds. One of these compounds is betaine, which protects the liver and reduces the body's level of homocysteine, a harmful substance that can contribute to heart disease and stroke. Betaine also increases stomach acid levels, potentially helping people with deficient stomach acid production. The level of health benefits may depend largely on what recipe you use. For example, a Polish white borscht with bacon broth, eggs and sour cream is less health-friendly than one with beets and perhaps additional vegetables. Skipping the sour cream can create an even healthier version. "Cooking Light" magazine offers a health-conscious borscht with mushrooms, onions, celery root, carrots, parsnips, red cabbage, garlic, tomato paste and, of course, beets.